Just a suggestion to Mr. Zzzero, but wouldn't it make more sense to have set Nations in place while still choosing the top MMR players from each region?? Something like.. North America + Canada, South America, Eastern Europe, Northern Europe. We already did Continents Battles where NA defeated both EU and SA. And you're suggesting the same idea. But this tournament is about something different. It is about playing for your country under your country flag. Unfortunately, some countries just don't have enough players and we group them together to give them at least some chance to participate. Of course, format may not be optimal, but it's just an experiment for now. Maybe we will make a bigger event in future. BSL ladder tour 2 is in 12 hours. Make sure to sign up/tune in. Please sign up for the tournament with your ladder nickname! Bakuryu - do you have BSL6-account? Only five days left until the deadline when we will select four best countries based on MMR. What is happening on ladder in the meantime? Biggest news of the recent days is, of course, Team Peru claiming first spot with impressive 22 points lead over closest pursuer, Team Poland. South Americans ladder very hard, meanwhile Poland is losing Bonyth from their team due to MMR decay. Come on, Tomasz, your fellows need you! Another big change happened with Team South Europe - all those countries combined don't have five players, so I decided to add them up to Team Western Europe. With this change every player in the ladder now is a part of some team, isn't this awesome? But the happiest thing about new formed Team South-Western Europe is that eOnzErG burst into the ladder and raised average MMR to the sky, allowing them to compete with Team Chile for the fourth spot in the rankings. With the distance between two teams as low as eight points, the battle should be very interesting. Many teams are suffering significant losses from players deleting their accounts or MMR decay. Most notably Team United States is left without JaeBT and Ty2. Even rising rankings of G5 can't help them to get back on track. Team Canada lost castle, Team Northern Europe falling down due to Madinho's lowering MMR (but on a bright side CadenZie is now in the team!). A couple more changes were made to the participating teams: Favorit is now counted as German and not Russian, which allows the former to improve their position a bit. We are also welcoming a lone Brazilian barcode player, he will join Mexicans and Bolivians to form a new team, the great BraBoMex! But enough talking, let's see the rankings! During Ladder Tour # 1 and # 2 there was a small misunderstanding about the format in which the final was played. In the first tournament it did not matter, but in the second tournament it actually did. In the rules I have expressed myself imprecisely, and Hatchet has been administering the tournament according to the format that I put in the news, so if you have a resentment to someone for that - it should be to me. I should have expressed myself more precisely in the rules - but when I was preparing the news it was obvious to me that if the format of the tournament is WB and LB, the WB winner should start with an advantage in the grand final. I have a lesson for the future. + Finals bo5, WB winner with 1:0 lead. In that case, how is the current case resolved? It seemed, Eon was quite annoyed, to put it mildly. And while I was excited to see T_T pulling out such a great performance, if we are to stick to the rules, there is still a final game left. And as a main organizer, you are to make decision when asked. Good, bad, make one. I haven't seen it in chat after the game. Note that Eon's decision to concede the game might be affected by his understanding of overall score. The whole idea of these tournaments was mine. I suggested prize pool distribution and using only one map, I wrote the rules, and I was admining first two tours. ZZZero only revised my text and posted it, assuming that finals rules are "obvious". 1. Allow players to practice on a new maps and possibly avoid the "what the hell is this map" situation in the main tour. 2. Make tournament not very long, because at least two of them were going to be played on weekdays. What did I decide? Make double-elimination tournament format, so all players will have a chance to play at least two matches on the new maps. How to make it shorter? Make earlier rounds bo1 and remove annoying bo5 finals. Do you remember that previous season two finals of the ladder tours were postponed and one of them never finished? But with bo3 finals it is ridiculous to give one map advantage for the WB winners - they will need to win only one map. In traditional sports this issue is usually solved by adding one more match to the finals in case if LB winner wins first. This is fair, because tournament is "double elimination" and you need to lose two series to be eliminated. But in this case finals may be sometimes shorter and sometimes even longer! So I decided to not put WB advantage in the rules. "Stupid!" - you'll say. But look at The International/2018 - they use similar format without any advantage. Are they stupid too or are there something behind this decision? I must say that from my POV winner bracket advantage still exists - player from LB had to defeat more opponents with much more unforgiving bo1 format. Was it a mistake to announce rules like that? - Probably. But probably not. Was it a mistake to not explain to players all the details before the match? - Definitely. Should players read the rules carefully before playing the tournament? - Definitely. Has the tournament been played according to the rules? - Yes. Should we change something in ladder tour #2? - No. P.S. I must say that all this post is my personal point of view and is not an official position of BSL crew. there is not case,trutacz is the right winner. i literally invented my own rules about how a double elimination tournament should work to find out that hatchet has other opinion,im the only one to blame. i was obviously dissapointed cuz i had other score in my mind and played with a mindset of bo5(1 game advantage) not bo3. Upcoming Ladder Tour will be played on this version too. 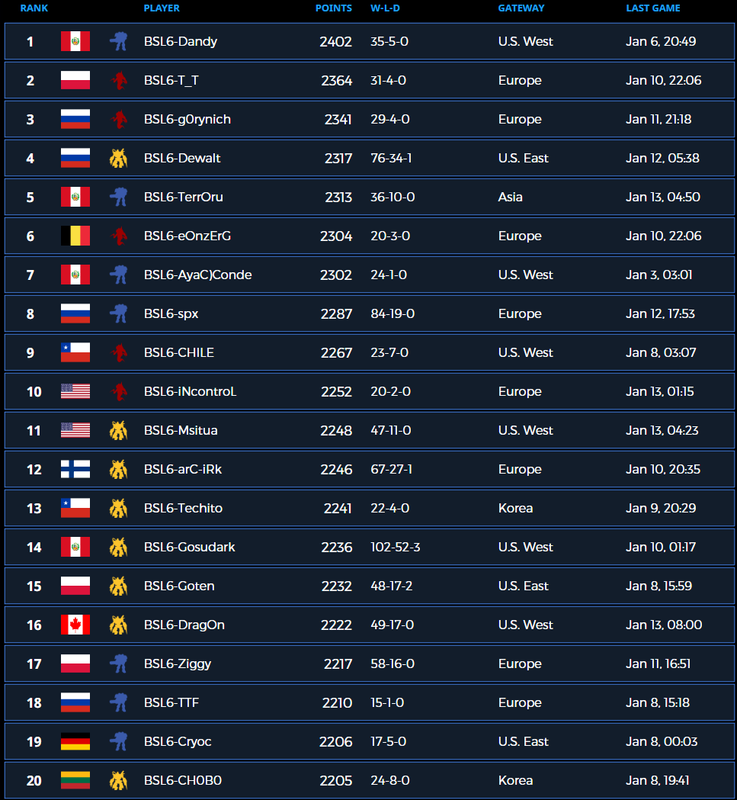 TOP20 Players of BSL5 Ladder - 13 days before ladder stage ends. TOP20 advance to Proleague ! TOP21 - 53 players advances to Gosuleague ! TOP54-100 players advance Chobolegaue ! Also, don't give up if you are under 100 position in the BSL6 rankings. After ladder stage will be finished, we will ask all the players for participation confirmation. Could not said any better than this, props to you mr. Hatchet_man! Also, today 19:00 CET we will retrieve final rankings for Nation Wars, so more announcements to come! 19:00 or 23:59 CET for NW?